President Obama has now formally asked Congress for a $3.7 billion “emergency supplemental appropriation” to deal with the crisis his open borders and de facto amnesty policies have created. The money would go to several federal agencies: $1.6 billion to the Departments of Justice and Homeland Security; $1.8 billion to Health and Human Services; and $300 million to the State Department, administration officials said. This more or less doubles the number administration officials were talking about just a day or two ago and to us smells suspiciously like something out of the old Rahm Emanuel “You don’t ever want a crisis to go to waste…” playbook. The request includes $1.8 billion for the Health and Human Services Department to provide “appropriate care” for the children, who are mostly coming from El Salvador, Guatemala, and Honduras. It also includes $1.1 billion for the Department of Homeland Security and Immigration and Customs Enforcement. The funding would help expand border security task forces AND help pay for transportation costs associated with the rise in unaccompanied children. In other words, without clear direction from Congress it gives Obama more money to disperse illegal aliens across the interior of the United States. For this reason alone we think Republicans should oppose the proposal and write their own enforcement only supplemental. But the initial response of Republican leaders has not been encouraging. Speaker Boehner’s office said that the House Appropriations Committee and a separate working-group of seven Republicans on border issues would review the White House’s proposal. However Appropriations Chairman Hal Rogers seems to have totally missed the game Obama is playing. What about sending them back where they came from Hal? 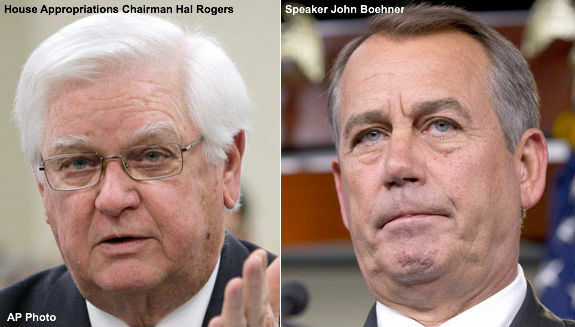 Rogers’ failure to grasp that the Republicans’ end game should be getting the latest wave of illegal aliens promptly repatriated is bad enough, but what should really concern conservatives and those interested in maintaining American sovereignty is Speaker Boehner’s comment that his working-group of seven Republicans on border issues would review the White House’s proposal. Members of the working group include Republican Reps. John Carter of Texas, Mario Diaz-Balart of Florida, Bob Goodlatte of Virginia, Kay Granger of Texas, Michael McCaul of Texas, Steve Pearce of New Mexico, and Matt Salmon of Arizona. Of those seven Republicans, Salmon is the only truly reliable advocate of American sovereignty, with Diaz-Balart being a supporter of the Senate’s despised Gang of Eight amnesty bill, and Carter, Goodlatte, Granger, McCaul, and Pearce tending to be solid votes for whatever Boehner and his leadership team ask them to do. Yesterday we said first, and foremost, any bill dealing with the current invasion of the southern border must be an appropriations bill only – and now you know why. By referring Obama’s proposal to this ad hoc committee Boehner has a vehicle through which the “comprehensive immigration reform” he declared to be dead can suddenly be revived. That’s not as easy on an appropriations bill because there are rules against legislating on an appropriations bill and the House also bans legislative language within appropriations conference reports. If and when a bill to appropriate the funds Obama has requested is introduced, the House must use its constitutional power of the purse to direct that all the new Department of Homeland Security money should go to the Border Patrol and ICE Enforcement and Removal Operations to detain (and quarantine where necessary), process, and remove the illegal crossers. There should be no money for Health and Human Services to warehouse them; there should be no money for any agency to disperse them around our country and certainly no money to fund the alleged "charities" that are currently being paid to resettle illegal aliens as “refugees” in a neighborhood near you. Submitted by gardener1776 on Thu, 07/10/2014 - 02:46. Do we need any more proof that Boehner is also a globalist? Republicans could cut all the money. If they don't what does that tell you? Submitted by Equalizer18 on Thu, 07/24/2014 - 22:31. We Must Secure our National Borders 100%, stopping all invasions into the United States. We can not afford taking care of any person entering our country Illegally. We are a country of Laws, and if people refuse to obey our Immigration Laws, then they all must be sent back, stopping this continued attack of our border condoned by our Marxist Islamic Terorist Lier-in-chief, Barry Hussein......Period..